Fred was diagnosed with Alzheimer’s disease. Attorney George Hough chose to focus his career on Elder Law after his mother developed Alzheimer’s and emphysema. Mr. Hough helped her throughout this experience in many ways. He helped her to qualify for Medicaid, which helped honor her wish not to become a burden to her loved ones and save her home for her family. While difficult, this experience has instilled in him a strong passion for helping seniors and their families. During his career he has helped over 5000 clients with a wide range of legal and planning problems, and he would be honored to help you as well. 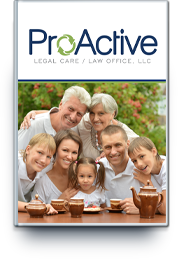 Contact ProActive Legal Care to set up a consultation with attorney George Hough. He will take the time to learn about your unique situation, and offer the best possible legal solutions for you. At this law office we offer a full range of elder law planning and estate planning where we create unique, personal relationships with every client. This allows us to respond properly to the diverse challenges that can be caused by chronic illnesses or disabilities as you get older. In order to accomplish your goals, we will work directly with you, your family, and a team of professionals to help set up a unique Elder Law and Estate Plan to address all your concerns. If you have any questions or would like to set up a consultation with an attorney, please contact us to speak with a friendly and helpful client relations specialist to get everything arranged for you. We have a passion for improving the lives of seniors…and their families! With a little foresight it is possible to help ensure you or your loved one will qualify for Medicaid to preserve as many assets for you and your family. Mr. Hough is always working on creating new videos on important topics for seniors and their families.